There are at least two reasons why vigilance is necessary: one, because we are imprisoned in our unredeemed flesh, and sin constantly takes advantage of us; and two, because there is a devil. (1) Because we have chosen not to follow the Lord and listen to Him, God will in turn choose not to speak to us; His life will be cut off from us, and our minds will be darkened in our understanding of the things of God. Then, if we persist in disobedience, this lack of understanding will cause our heart to be callous and we will choose to give ourselves over to sensuality—for the practice of all kinds of impurity and greediness (Eph. 4:18-19). (2) Our obedience to sin will enslave us to it (Rom. 6:16, 7:15). (3) Because of our sin there will be produced in us a feeling of shame (Rom.6:21). (4) Inasmuch as we will be spiritually dead we will be unable to pray. (5) Because we have given up vigilance in disobeying Him we will find that we won’t have the spiritual power to be vigilant. Hence, we won’t be able to sense the urgency of the hour; we will have fallen asleep, so to speak, and will have forgotten about being watchful for His coming. So we find that the more we sin the less we have the power to change ourselves—and we feel quite hopeless. Therefore, lest we get into this kind of a predicament, let us stay alert and watchful, putting on the Lord Jesus Christ, and making no provision for the flesh in regard to its lusts (Rom. 13:14). 2. Because there is a devil. A second reason why vigilance is necessary is because the devil is always near and we need to be aware of him. Where there is sin or a draw to sin you can be sure that the devil has somehow been involved. He is real and he is active. It is important to have vigilance so we can better know what he is up to, what his nature is, how he is organized, and what his strategy is—for an ignorance of Satan and his maneuvers leaves us at a great disadvantage in the conflict, and brightens his hopes in overcoming us. Yes, Satan does not want us to know about him or to even believe in him. That way he keeps us in a hazy cloud and is more conveniently able to take advantage of us. With this in mind, here are a few things I believe God wants us to know about Satan, which will aid us in our further vigilance, to obtain victory over him: Satan’s goals, his character, his government, and his strategy. This post is an excerpt from Purpose of Prayer. 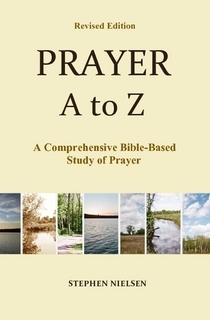 This entry was posted in Prayer A to Z Excerpts, Vigilance in Prayer, Prayer Warfare and tagged prayer, Satan, sin, spiritual warfare, vigilance in prayer. Bookmark the permalink.